Top Ender went to the School's Halloween Disco last Friday as a Zombie Cheerleader. 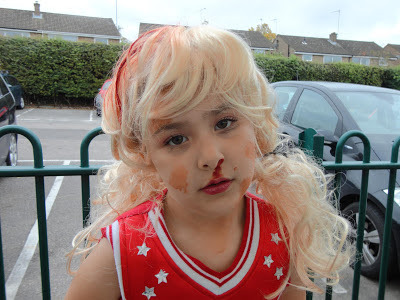 She'll be dressed up again tonight as the same thing for the Halloween Party we are off to. It's a bit scary how natural she looks when playing dead! 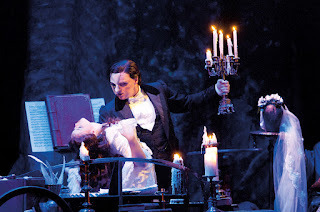 Months ago, before I arranged to go on Holiday with the family I got tickets from Milton Keynes Theatre to see Phantom of the Opera. My Mum had been to see it in the West End when it was fairly new and so we've worked out that she probably saw Michael Crawford as The Phantom and so we were looking forward to seeing it. Then I realised that I'm on Holiday at the wrong end of the country and so if I wanted to see this show I was going to have to cancel the family holiday, and that was never going to happen! So I did what every good daughter and sister would do and asked my Sister to take my Mum. This is their review. Hello This is Kitty! You may know me from Twitter, occasional mentions here on A Mothers Ramblings and the odd comment or two on Facebook. What you probably don't know about me is that like Pippa I love the theatre. When we got to the theatre my Mum showed me what she and Pippa normally do (buy sweets, read the programme, talk to the Press team) and then we went and found our seats and waited for the show to start. Like Pippa I've always wanted to see Phantom but timings have never been right and so this was my first time. My Mum and I loved the production, it was really dramatic and I didn't expect to be so emotionally involved, or to get the fright of my life at the end of Act One. Just remember if you are sitting in the first fifteen or so rows that you won't be hurt no matter how convinced otherwise that you are. Phantom moved along at a good pace, it wasn't so slow that I got bored and it wasn't so fast that I couldn't keep up with what was going on and hearing the music that it seems I have grown up with live, was a real treat. I haven't stopped singing all the parts that I know since seeing the show and I was really pleased that Pippa couldn't go so that I could, just don't tell her that I said so! The Phantom of The Opera is at Milton Keynes Theatre until the 24th November. We were given two tickets to see the Show by Milton Keynes Theatre. It's half term so we haven't really got lunch boxes this week, but because we are away and we are trying to save a bit of money where we can we will be taking some food out on our day trips with us. Of course with Big Boy being a Diabetic we also need to make sure that he eats at regular times so this should help us, ensure that he always has a lunch close by. So this is my "rough" plan of what we will be eating for lunch this week. We are mostly going to be travelling today, so I thought that leftover Chicken from yesterdays Roast was going to be the best lunch ever for the four of us. There will be fruit, flasks of Hot Chocolate, personal water bottles, some Squash and if I get my act together today then hopefully some cookies too. There is a supermarket about ten minutes away from where we are staying so we're going to pop in and purchase a few bits and pieces on the Monday afternoon/night. Two of the things that we are going to pick up are some nice rolls and some good ham. That way our lunch today will not only be fresh, but tasty too! There will be some salad to go in the rolls for Daddy and I, and maybe some form of relish, but until I buy it I'm not sure! It has to be done at least once when you are on holiday, a sort of cold supper. Sausage Rolls, Cold Meats, Salad, Fruit etc. The children will love it as it is their favourite kind of lunch and Daddy and I will have a nice sort of Ploughman's Salad out of it. I was going to buy some cheese to put on top of the Spaghetti last night, so I figure that I can use the rest of it up on sandwiches for lunch today! If we did buy relish to go with the ham, no doubt Daddy and I will have some in our Sandwiches today too. We're travelling home today so I'll be using up the last of everything today to take on the journey home. There will be at least one round of pork sandwiches, I guessing a few cheese sandwiches and possibly some ham ones too. The good thing is that it's a frugal lunch just like we started the week, even if it isn't a special Friday lunch like we are used to! So what are you planning for lunch this week? I was out at an Aunt Bessie's event yesterday, we were cooking with a few different Aunt Bessie products and discovered that they sell Frozen Gravy! Seriously frozen gravy! And it's GLUTEN FREE! Why that isn't on the box in big letters I don't know, but I know it is now so I can tell everyone I know and they can tell everyone they know and... okay on with the menu for this week. I was tempted to do a Favourites night because everyone (by that read Daddy) was being useless when helping with any food choices this week, but I decided in the end that I had better take charge and plan something great. As I'm going to be at my Mums in the early evening I figured I needed something that Daddy could easily make without me so I decided on Stir Fry with Rice. I'm not sure if we'll have Duck or Chicken, but it will be a bird of some kind! It's Sunday, it's a Roast. Daddy cooked last week as I was at Church and he did a fantastic job, including making some Gluten Free, Egg Free Yorkshire Puddings that were, well horrid actually! Sorry honey, I know you tried, but don't try again. This will be our last weekly Roast Chicken until January, so I've got to make sure my family make the most of it. Also yesterday the Aunt Bessie people shocked us by saying that a lot of people don't have gravy with their Roast dinner. Can you believe it? That's Sacrilege that is! I was less shocked about how many people don't eat Yorkshires with their Roast, as everyone knows that Yorkshires are only for eating with Beef and on Special occasions like Easter, Christmas and Toad in the hole. After finding out from Susan that Pizza Hut now do Gluten Free Pizzas we decided to treat ourselves on holiday and go for a Pizza as a family! As we're going to be walking a lot it's not like the calories are going to matter. Spaghetti Bolognese. We are going to be (hopefully) going to a Halloween party too so this is easy to make, eat and there will be leftovers for when we are starving after having danced to the Monster Mash, Thriller and other Halloween Top Tunes! I'm thinking that a little bit of Pork, Mash and Vegetables will be a lovely meal and something that everyone will happily eat. Plus it's an easy cook so it won't mean that either I or Daddy miss out on the family fun. We're having a Friday treat and having a McDonalds. We're going to be travelling home today so we figure if we're running late we can grab something for Big Boy to eat on the move (he needs regular meals for his insulin injections to be most effective and not have crashing blood sugars) and if we are back home then we aren't really going to feel like cooking seeing as how we've been travelling all day. So that's the meals this week! What are you up to? I was given free travel to the Aunt Bessie event and given some food to bring home too. The Yorkshire Puddings didn't last more than a couple of hours in my freezer as the children demanded them for dinner! Every Christmas my sister buys herself a diary. She carries it around with her in her handbag and puts every thing in her life into it. For several years she has brought me one too and I keep it going for a couple of weeks before forgetting about it and it ends up in the bottom of my bag covered in biscuit crumbs and some kind of gloop that I think every handbag must secretly be filled with but only mine leaks. In the end I started keeping all my appointments on an online calendar that I could access from my phone, but secretly coveted something like my sister has. Then Filofax sent me a Pink Domino personal organiser to have a play with. I got a lot of ribbing from Daddy who wanted to know if I was going to be putting in a note of our coal deliveries and how were the 80's treating me but I ignored him, slotted in my new Cross Pen that I got from the London Blog Camp and set to work putting in notes of upcoming appointments and details of things that I shouldn't forget. 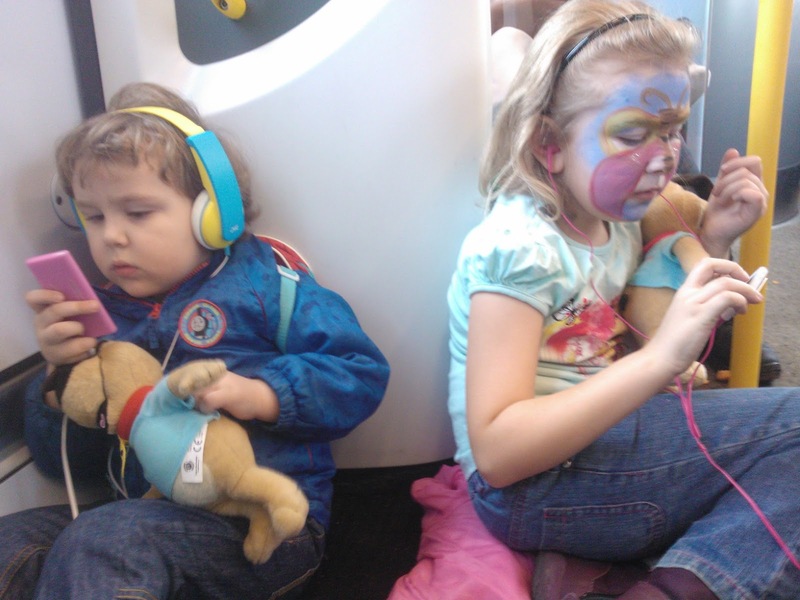 Sure they were in two places now (online which syncs to my phone and to Daddy's too) but I was going to do this properly. 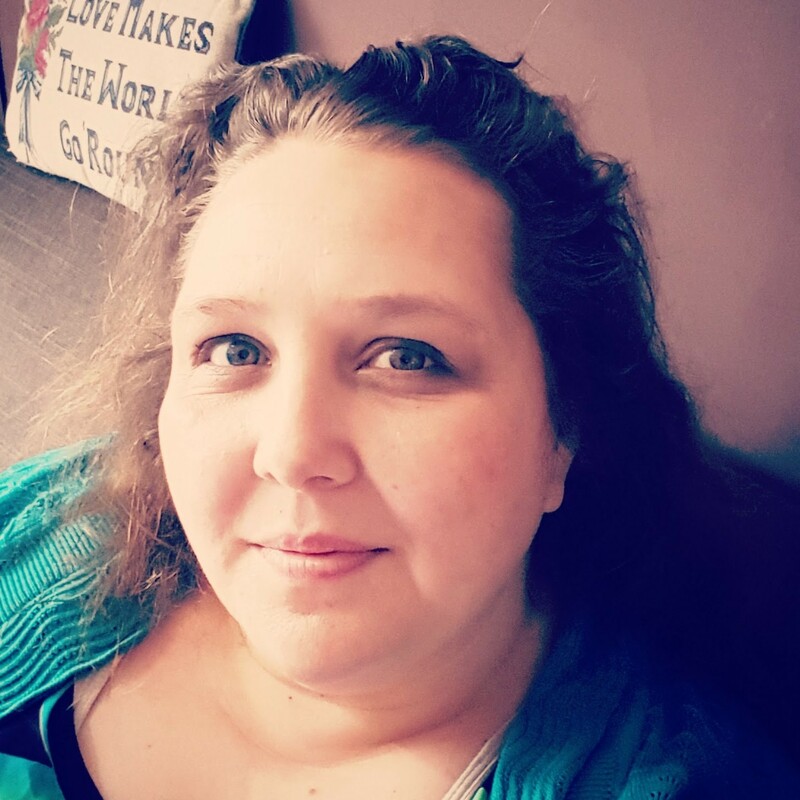 A few days in and all was good, I'd made note of my ever shrinking weight and measurements, I'd made a note of Big Boy's Blood Sugar levels, the days when he had lows, and all the School dates that seem to quickly fill up the emptiest of social schedules. It just didn't seem to be right for me though, I wasn't using the Filofax to the fullest, I wasn't using it to my own advantage. It was handy having a "solid" note book whilst coming back from The MAD Blog Awards I was able to sit on the train and jot down a few ideas for blog posts and names of people that I want to follow on Twitter and those who I want to add to my blog reader. I was slowly making it more personal to me, it has a few goals in for me, my blog, my home and I brought some stickers the other day too. 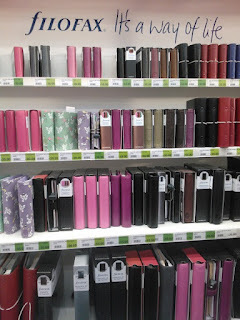 It's because a filofax is so very personal that you can't look at what others have done to their filofax to make it personal for them, and then use the ideas to make it personal for you, but I tried anyway. As predicted it didn't work. A few days later and whilst sitting in the car waiting for Daddy to finish work I made notes of what the Friday lunches should be for the rest of this year and some notes about future ideas. I found this perfect because I like to keep the ideas secret until the children get them in the morning and I don't have the greatest memory. Then at the weekend I went to Church, I needed to copy some personal information down and when Bishop presented me with this information I didn't have to hunt around for a pen and paper or beg some off someone else, as I had my filofax there. And suddenly I understood how to use the filofax for me. I don't have to use it as a diary for my appointments, I can use it to work out menus. I don't have to use it as an address book, I can use it to make notes of Twitter names of people I meet and those who I always forget. I don't have to use the note system for things to do on a daily basis, I can use it for long term goals. As long as I have the Domino with me I can use it for what I want. The point is anyone can use the filofax in the way which benefits them the most and having a neat note pad and pen handy in my bag all the time? Well, I think it makes me look a lot more professionally turned out than the battered pieces of paper I'm normally carrying. 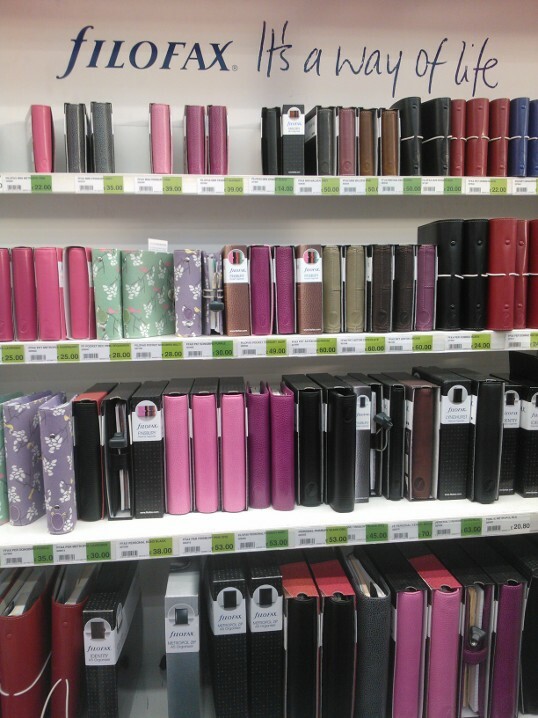 Take a look at the 2013 diaries and let me know which one you are after! I was sent a Domino Filofax to review. I love a Roast and I normally have leftovers so I normally make Roast Dinner Soup, but I created this Autumnal Roast Butternut Squash and Sweet Potato Soup Recipe and it really tasted lovely, so I thought I'd share it with the world. Put the oven on Gas Mark 7 to warm up. Cut the Butternut Squash, Sweet Potato and Onion into bite size chunks. Place these in a roasting tray. Peel the garlic cloves and place in the roasting tray too. Mix together two tablespoons of Lemon Juice with a tablespoon of Olive Oil and season as you like. I used Salt and Pepper the time I took pictures, but have used different herbs I have in the cupboard too. Pour the oil mixture over the vegetables, making sure that they are all covered. Roast the vegetables for forty minutes, making sure to stir the vegetables after Twenty minutes so that all the vegetables get an even colour. After the vegetables have roasted add to a pan along with the stock. Simmer the vegetable mixture for five minutes or so to ensure the vegetables are soft. Let the mixture cool before transferring half the vegetables and all the stock into the Blender. Use the Puree function to make the mixture in to soup before transferring back into the pan (along with the non chopped vegetables) and heating for five minutes before serving. Serve with plenty of buttered bread and you will easily serve four. We were sent the Bodum Bistro Blender to review. It sounds like it shouldn't happen doesn't it? Iced Hot Chocolate. Anyone who has ever had one though will tell you that it is one of the best things since... well since Hot Chocolate! This is how we make it. Add the milk to the Blender, add to it the Cocoa Powder and the Brown Sugar and then mix the ingredients together. When the ingredients are well blended add the ice cubes and change the machines settings to Ice Crush before setting the machine off again. When the drink is the consistency you want pour into glasses before topping with Whipped Cream, Marshamallows and Chocolate Sprinkles or other toppings that you like. Serve and don't worry about waiting for it too cool down to allow you to drink it! The drink will serve four. I've yet to meet a child that doesn't like a cookie or two, actually saying that I'm yet to meet an adult who doesn't like a cookie or two! These Oat and Date Cookies are lovely just out of the oven, or if they last that long, they still taste great after a week of being kept in a tin. Turn the oven on to Gas Mark 5 to warm up. Line a tray with baking paper and put to one side. Cut the carrot into large chunks and then add the Dates and then the carrot to the Blender. Using the Blender on the Chopping function (show by a diagram of a Mezzaluna) run until the pieces resemble a grated paste. Add the Date and Carrot mixture to the Creamed Sugar and Butter and mix well. Add the Egg, Plain Flour, Baking Powder and Oats to the mixture and again mix well. Sprinkle in the Chocolate Chips and mix to distribute them about the mixture. Using a Tablespoon, drop spoonfuls of the mixture on to the lined baking tray before placing in the oven for around fifteen minutes (depends on how big the biscuits are, how crunchy you want them to be and how good your oven is!). Place on a wire tray to cool before storing for up to a week in an airtight container. The cooked cookies can also be frozen. We were sent a Bodum Bistro Blender to review. One of the great things about going to the theatre every week is that I get to spend an evening with my Mum. When we found ourselves last week without Theatre tickets we were wondering what we should do. 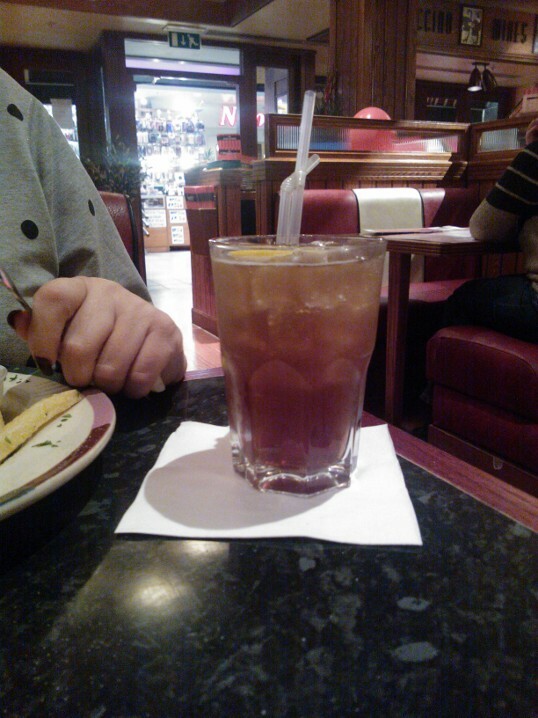 We decided that what we should do was go out for dinner, and then Frankie and Benny's asked if I'd like to try out some of their new cocktails and they'd throw in dinner for me and a guest too! My Mum and I had been to Frankie and Benny's to eat a couple of years before, she fell in love with the Buffalo Wings which were so hot they made our mouths go numb but we couldn't find them on the menu. Luckily our Waiter helped us find them and he made a couple of suggestions of what Cocktails we should order based on what he had observed of us, whilst we were deciding what to eat. It turned out that my Mum had a Pina Colada and I had a Gentle Breeze with our starters and we both thought they were rather delicious, although my Mum did get a brain freeze when she took a big slurp through her two straws. 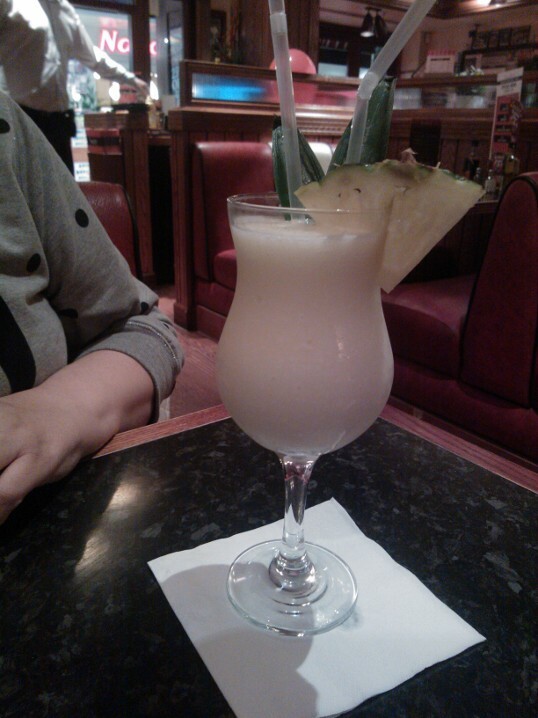 My Mum had a Long Island Ice Tea, which she liked, but she said after she had drunk it she would have rather had another Pina Colada! 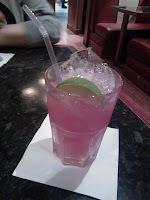 The cocktails are priced between £4.95 and £5.95, with pitchers available of some costing £8.95 for two people and £13.95 for four people. There is also a few non alcoholic cocktails starting at £2.95 and I can personally vouch for them. We were given a voucher to pay for four cocktails, and a two course meal for me and one guest. It's the last week at School before Half Term and so this week all the lunches are going to be Halloween Themed just like Friday's gone was. Did you see it on our Facebook page? We had some Pickled Onion Pom Bears in the lunch which are a limited edition for Halloween. They are actually really lovely and as they are Gluten Free Daddy took a pack to work as a treat too. I have a feeling they might disappear more quickly now that Daddy knows they are Gluten Free! We have chicken to use up from the Roast yesterday and I'm loving making Spring Rolls at the moment, so some protein heavy spring rolls for Big Boy will help him with his sugars so he can enjoy a sugary treat as his pudding. This is almost in defiance of the stupid Twitter Follower who accused me of Child Abuse for feeding my children fatty foods, but mostly it isn't and is because if you can't enjoy a Cookie as a pudding when you are a child then when can you?! Technically this will be a Ham sandwich in the shape of a Witch but why let that get in the way of a good title? Big Boy remembers the Witch Sandwiches from last year and is hoping that I might be able to find some more Halloween cupcakes to accompany them. What he doesn't know is I already have them in the cupboard! It's a quick lunch for Top Ender today so that she can go to Orchestra and still have time to eat her lunch without getting indigestion. These were so fun last year, with lots of people saying how fab they were so they had to be back on the menu this year. They are really easy to make and are really cute. I think that the children love cheese pittas as they are always eaten and never come back home. Actually saying that all of the lunches that I send the children to School with come home completely eaten, even if it is something I know they wouldn't eat at home. I'm guessing that it's a good kind of social pressure at lunch! You might think that I've used up all my ideas for Halloween themed lunches, but this Friday's Special Lunch is going to be fantastic... I hope. I had the pudding idea first (well I saw it on Pinterest) and worked everything else around it. I asked the family what they would like for dinner this week and they, surprisingly, already suggested meals that I had planned. It didn't help with the allusive missing meal that I always tend to have each week (seriously I can always plan for six days but not seven) but at least I know that me and the family are on the same wave length this week! I'm out shopping with my Mum on Saturday afternoons which means that when I get home I don't really have time to cook or cook anything complicated. Luckily though my lovely husband likes making Pork Chops with Apple Sauce so he can cook whilst I get ready for the evening, or go to the gym or I might even go and read the rest of my book! I told Daddy that this week was going to be one of our last Roast Chicken Dinners for a while and he got really upset, until I explained that it was because we'd appreciate our Christmas Dinner more if we hadn't had Chicken Roasts for a while! We are fairly traditional here and so it's Turkey Roast on Christmas Day with all the trimmings and I'd like to think it that it is the best roast of the year. This was what Big Boy suggested, he was very insistent that it wasn't Sausages and Chips, but Chips first and then Sausages. I'm not quite sure what difference it makes but Big Boy gets a say just like everybody else! Not only am I attempting to make Chicken Kiev's, but I'm also making them Gluten Free too. They aren't that hard to make though are they? There is a recipe that I think I read on Tesco Real Food that I will bare in mind when I'm making them but as far as I can tell you cut a chicken breast add some butter with garlic and parsley chopped up in it and then roll in a breadcrumb and cook hoping that the butter doesn't escape out. I bet my butter does though. I thought I would make a rather lovely Dauphinoise Fish Pie and serve it with peas and some garlic mushrooms. I'm not sure why with the mushrooms, but I thought they would be good! Daddy loves burgers and we don't eat them all that often as a family (he has them for lunch fairly often) so I thought some good home made burgers should be on the menu this week. I might make the feta ones I made with the McCain Wedges or I might make the ones I made before with chopped tomatoes. I just don't know until I've done the shopping. Every time I say I'm going to make a Beef Casserole for some reason I don't. Today though I really, really am. I even have my Nan's casserole recipe to follow so it will be a great casserole. I'm going out to meet some people from Aunt Bessie's today so my casserole will be in the slow cooker all day and it means I can use a slightly cheaper cut of beef as it will be very tender cooking all day. So that's the plan for the next week, and very tasty it will be too! I just have to get myself back into the routine of cooking dinner so that it's served around 5:30 everyday as it really does make a difference to Big Boy's diabetes. Anyone have a trick to get themselves cooking at a set time? Last Monday my Mum and I were in my car driving along a fairly main road on our way to dinner. It was raining and thanks to my recent time with Quentin Willson and Shell I was driving really economically (read slow) when something moving up ahead caught my eye. I thought it was a dog but it wasn't. Up ahead was a cyclist. The cyclist was wearing all black clothing, had no lights on his bike, no reflectors other than the standard ones in his bike wheels and pedals and to be honest I was lucky that I saw him when I did. A few seconds later and I might have missed him and had a terrible accident. As we carried up the main road my Mum started counting the number of people walking and cycling not wearing reflective clothing. We counted ten people in less than 200 yards, each of them wearing dark clothing, each of them not easily seen until we were almost on top of them and each of them not aware that a few simple changes could easily stop them from being run over. It made me feel a little sick knowing how these people were taking a risk with their lives and it made me think about my own children's safety when walking at night. It's not often that they do walk about at night, and if they do they are with me but with Halloween, Bonfire night and Christmas coming up we will be out in the dark, walking home from Town, walking to Friends, walking to see local Christmas lights and I want them to be seen and be safe. We got some reflective stickers from Wilkinsons sent for Halloween, these will be perfect whilst we are out Trick or Treating this Halloween and I've seen some Glow in the Dark Hunter Wellies that would be perfect for the Children this winter too. These are easy things that I can do to make sure that the children can be seen by those driving cars and they do make me feel a little better, but what else can I do? Does anyone have any suggestions? We were sent the reflective stickers by Wilkinsons, but if you see my Foursquare checkins you will know I'm the mayor of my local store because I go in there so much! Most people who know me, know that I'm a cheap date. I'll pause for a minute or two to let you snigger quietly to yourself whilst thinking about me being a cheap date... Right, let's get back to it. As most people know I don't drink alcohol and as such you can give me a glass of any fizzy drink and the bubbles will soon have me as giddy as a school girl. The problem for me is since giving up Dr Pepper at New Year I now can't actually drink a lot of fizz in one go and so if I buy a bottle I don't finish the bottle before it goes flat. I used to own a Soda Stream, it was the first thing that I added to my wedding gift list as there had been many memories made with the one that my Grandparents had owned and I had thought that one would be perfect for me now as I could make just a small amount of fizz and it wouldn't go flat before I had a chance to drink it all. Then in a serendipitous moment Soda Stream asked if I'd like to review one of the new Soda Stream Machines. How wonderful is that?! The first thing I did was look up when Soda Stream are bringing out the Dr Pete mixture in the UK, after not being able to find the answer but finding a rather fun thread by a group of people debating on how to make a Dr Pepper type syrup to add to their Soda Stream, I figured I should give up and just move to the States. The second thing I did was make up a bottle of fizz. Cherry flavoured fizz because I like Cherry and Daddy doesn't so I knew I would get to drink the whole litre myself! I had to read the instructions a couple of times. I'm not sure if it was because it was late or because I was stuck in thinking about the old machines that I had used but eventually I got it put together, got busy with the fizzy (I'm so disappointed that isn't a phrase associated with Soda Stream any more!) and made myself some rather lovely Fizzy Cherry. As suspected Daddy was rather disappointed that I had made Cherry so that he couldn't drink any, and planned to make something for himself next, but as soon as the bottle was empty it was Big Boy who made the next bottle! Big Boy thinks the Soda Stream Machine is amazing but has to put his hands on his ears whenever the fizz is put into the juice as he doesn't like the sound. Compared to the old machines that I remember from my youth and early marriage, the machine is a lot sleeker, but still does the same basic function (makes stuff fizzy!). It looks great on the side in the kitchen (I haven't put it in the cupboard like most of my other appliances) and it's getting regular use. I've added different bottles of the Soda Stream Syrup to my Christmas Pinterest Pinboard as Stocking Fillers for me and I'm sure that Santa is reading my list and remembering to add it to his Sleigh and if he doesn't then I know that my very lovely husband is reading this blog post and will remember to put them under the tree. I was sent a Soda Stream to review. I apologise for the lack of pictures of our lunches on our Facebook page this week, for some reason it just wasn't happening in the morning (I blame the dark) and even last Friday's special lunch had some last minute adaptations because of me ending up sleeping later than I expected. Still the children went to school with lunch every day and that's what is important! I'm back to leaving some of the chicken from the roast spare so that Tops and BB can have it for lunch today. With a little sweetcorn it's good because it just ekes it out a little more and means I can have some for lunch too! If there is any that is! If there isn't then it will be a selection of party type food, little sausages, sausage rolls, tiny sandwiches, vegetable pieces and of course something sweet! There will definitely be some Soreen lunch box bars, as despite giving them out to anyone and everyone we still have a cupboard full! I'm going to experiment this week and see if I can keep toasties warm enough in the Bento thermos lunch boxes that they aren't rubbery by the time the children come to eat them and if they pass the test then the children can have toasties today. If they don't pass the test then plain old Cheese sandwiches today. A little clue this week, there are going to be Pom Bear Crisps in the lunchboxes this friday, as we were sent some by a PR who knew that we love the gluten free snack. I've had to hide them from Daddy because he would eat them all if he could! Many Moons ago I gave up alcohol. I know, some of you right now are sitting there pondering about giving up alcohol and wondering how you could ever do it, but when you are 18 and not really that much of a drinker it isn't that hard. I started drinking Shloer at Special events and with Roast Dinners, because it was a grown up soft drink and it seemed a lot posher than drinking Lemonade. It's okay, I'm not bitter about it. I like that lots more people drink Shloer. It makes it a lot easier to host a get together if everyone knows that the bottles of Shloer on the table aren't wine but soft drinks and suitable for drivers and non drivers alike. So if you come to a party at my house, don't worry about making sure there is an non-alcohol alternative drink as it's all I'll be serving. I was sent two bottles of Shloer, which I drank with some friends! Wahoo! It's Saturday! I do love a Saturday because I get to think about food and what we will be eating for the week, I get to go shopping (so I get half hour on my own!) and I get to see my Mum who always gives me one or two of her chips from her Saturday evening McDonalds. I must also remember to keep dinner being served at the same time because it really makes a difference to Big Boy's blood sugars if I serve dinner late. So on to this week! Last week after we had been given a Driving Master Class from Quentin Willson we headed off to Wing Yip's, a Chinese Warehouse in Birmingham. There were a few bits and pieces that we wanted to see if we could get and we wanted to have a look round too as the only thing better in my mind than going to a Chinese restaurant is making Chinese dishes at home and it's a great place to get inspiration! We didn't manage to get everything that I wanted, but we did pick up a few bits that I'll be using tonight for my first foray into making Spring Rolls. I just hope it works or we'll be eating it stir fried. Despite really looking forward to a proper roast last week, when it came down to it I did Mashed Potato instead of Roast Potatoes and whilst I was pleased the rest of the family were a little annoyed. I'll know better this week and will make sure that I get everything sorted out before going to the gym so that we can all be happy with the meal! 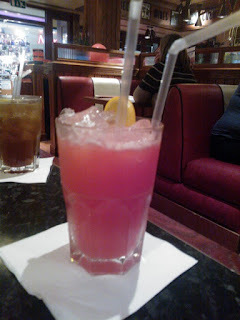 I'm being really naughty this week as whilst my family are at home tucking into Fish Fingers (Gluten Free for Daddy), I'm going to be out at Frankie and Benny's (they offered to pay, I couldn't say No now could I?!) 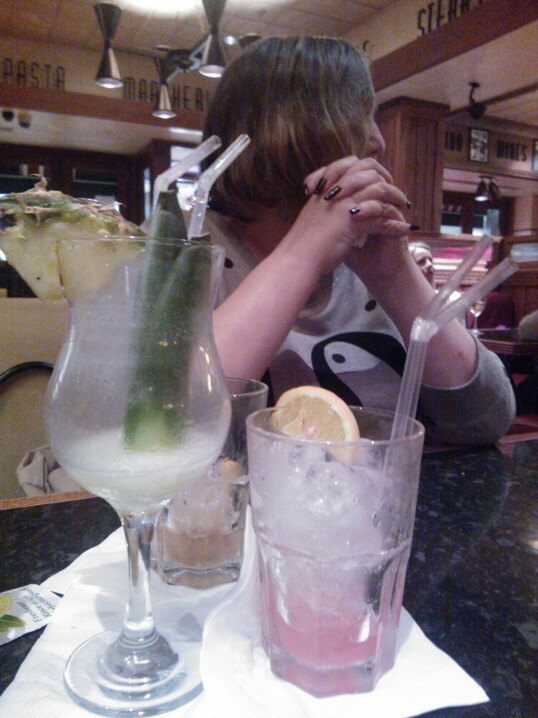 with my Mum drinking some of their new range of cocktails. Well, she will be I'll be sticking with the Gentle Breeze or Amalfi Sunrise which have no alcohol in them! We are having a little Twitter Party and some of the Playground Mums and their Children are going to be with us celebrating all things Sylvanian. The food is going to be mostly for the children and be party type food, although I will make some canapés for the playground Mums to munch on whilst the children play. I love pasta of all types, and I find it easy to make, after all it's not really that hard to make a tomato based pasta sauce but I'm bored of it so I thought I would make an egg free carbonara sauce (Daddy is still reacting to large quantities of egg) and that would also help me use up a pack of Bacon I found in the back of the freezer. We really liked the spicy sausage rice dish I made back in August and as it is good value and really easy to make I thought it would be a good Thursday night meal. I'm off to Aqua after dinner, so I have to remember to eat early so that I don't have it repeating on me whilst the instructor shouts "POWER" like Jeremy Clarkson and has me giggling into the swimming pool trying not to distract everyone else in the class... it never works. Last Friday Big Boy and I were talking about Fish meals, when he said he only liked my fish dinners because he knew the fish was dead! I'm pretty sure some cartoon has freaked him out somewhere along the line, but as the Gluten Free Battered Fish and Chips we had the other week was eaten by everyone including Big Boy, I figure that a repeat this week isn't a bad idea. So that's my meal plan for this week, it's looking like a fairly cheap shop (which is a bonus!) and I'm looking forward to the meal preparation. What night do you think that you might be coming round? Could you all not make it Sunday? There won't be enough Roasties to go round! When a rather large delivery of Soreen arrived at my home, as part of the MumPanel Soreen campaign, the children were ecstatic and with the boxes taking up all the kitchen work surfaces I wondered if I actually knew enough people to give the products out to. Luckily though I didn't have to worry as the children tucked in to Soreen as a pudding and to make a dent I gave some to Daddy to take to work. The chaps at Daddy's work made short work of the mini loaves, with one of his colleagues confessing that he had never eaten Soreen before but managing to polish off an entire Toastie Loaf in one day! I think Soreen may have a new fan. Top Ender asked if she could take in some for her teacher and Big Boy wanted to do the same, so some more packets were shipped off to School, where I understand from Miss Charles (Not her real name protect the innocent and all that) that they were eagerly eaten in the staff room by those teachers who hadn't packed a fantastic lunch box like Tops and BB get! 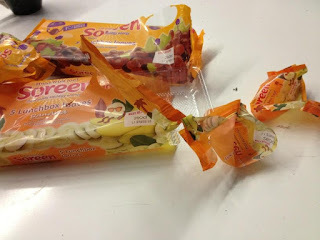 I put some to one side to give to my Sister, as her girls love Soreen as much as Big Boy, and I took a bag packed full of the Soreen up to the School to hand out to the parents that I know. All of the Mums had something they remembered about Soreen, High Heels Mum informed us that they are only two Weight Watchers Points (I think she means per lunchbox loaf! ), Neighbour Mum said that she had seen the loaves in the Supermarket the other week and admitted that she had never eaten it toasted, Geek Mum (Do you like your new nickname?) said that she and her girls love the stuff and Young Mum was so happy with the packs she opened them up there and then and her children had them as an afternoon snack! I took some to the gym this morning and both the Reception Staff there and Young Mum yesterday afternoon said that she only ever eats Soreen when it's buttered and that it's an indulgent treat so we joked about having some alone time to eat Soreen, possibly whilst sitting in the bath... with the children at School for another couple of hours I think I might go eat some toasted buttered Soreen in the bath! I am receiving a fee for talking about Soreen and I did get a lot of Soreen delivered to my house to give out to people, but as I have said we eat Soreen, we love Soreen and these are all my own opinions. Growing up I, like most children, listened to the music that my parents decided I would listen to because that was the music that they wanted to listen to. I didn't mind though, the music that my parents listened to told stories and I learnt the words and the tunes quickly and would be able to sing and dance along. My parents would tell me stories of the people who sang the songs, things that they had read in newspapers or heard on the news, Celebrity Gossip I guess but it didn't seem like it, it was just glamorous stories of glamorous people. I was originally going to take my Sister to see Soul Sister, as it's a musical following the life of Ike and Tina Turner as their careers really started and their marriage fell apart, but my Mum and I went along, ready to sing along to songs that I had grown up listening to her sing. I was a little worried as whilst I love going to the Theatre, I'm the sort of girl who likes to sit and my seat and be entertained and I had a feeling that this show required the audience to participate, to give the energy that you might get from a Live Gig. I was right, the audience did need to be awake and ready with the cheers and dancing and clapping and I doubt any of the audience were disappointed with the actors performance as like their singing they really were giving it all they had. My only criticism was the way in which they showed the passing of time, with images being flashed up on Stage, (it's a pet hate of mine) but I guess that just like the Celebrity Gossip stories from Newspapers I was told as a child these images were just allowing the audience to be able to see the important things happening in the foreground of history whilst keeping the more gossiping angle of the lives of the Turners to the stage. The show is in Milton Keynes until the 13th October, and if you are in the mood for a feel good musical with songs you will know then pop along and be ready to let your hair down. 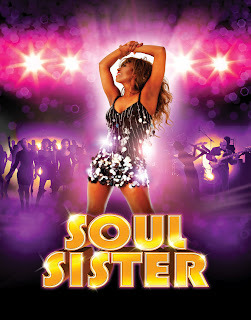 We received two tickets to see Soul Sister from Milton Keynes Theatre. We've taken some inspiration this week from some sandwiches that we had at the Shell event we went to on Saturday. Big Boy and Top Ender were really well behaved and very good at trying sandwiches that they might not have tried otherwise! The children don't really eat a lot of beef, I'm not sure why. I guess it's my fault because I don't make beef sandwiches! I've made sure to add it to my shopping list this week though so I can rectify this! We haven't got left over Chicken this week to use up on the Monday because I made sure to use all the chicken this week on the Sunday! I have some cute little rolls in the freezer that I really need to bake and I think that chopped egg and a little mayo would be a good filling, especially as the children loved the ones on Saturday! Top Ender has Orchestra today and so we like to make sure that she has a quick lunch to make sure that she has enough time to eat, get a quick break/lung full of outside air and then get her violin ready for Orchestra. We decided on a Ham and Cucumber Sandwich as I can use one of my sandwich cutters to cut the crusts off to make them a little smaller! I tried appleslaw the other day in a sandwich and I really loved it. I figured that the children would like it because apple and cheese is a great combo and it's on Bagels which the children love ever since I told them that they are doughnuts without sprinkles! Friday - Top Enders Friday Lunch And Big Boys Too! I had a great idea for a lunch and told it to Daddy and he agreed that it was a great idea, we just needed an event that we could use it for... Today we decided it was the best day though because tonight we have the England V. San Marino Football match and it works perfectly! I seem to be suffering from a complete brain freeze this week and despite knowing that I do have some things in my freezer I can't remember what they are, and as it is currently dark, wet and I'm in my PJ's I'm not going out to the dark, dusty garage to look! You have to love a McDonalds on a Saturday! We're off to see the lovely people at Shell today as part of their Target One Million and so when we drive home we're going to go via McDonalds. Plus as there isn't a Dr Who on tomorrow night we're going to need something to look forward to! The best meal of the week, with the potatoes and the chicken and the vegetables and the gravy and the yorkshire puddings... Sorry I just got lost there for a second with the drool and the thinking of the tasty stuff! Hopefully before me and my Mum go to see Soul Sister at Milton Keynes Theatre tonight I'm going to manage to cook some lovely Pan Fried Lime Cod Fillets and serve it with Rice. If I don't manage it then my Mum and I are going to be starving by the time the show finishes! For me growing up it was one or the other, but when Daddy and I started dating he introduced me to the wonderful meal that is Soup and Toasties together! I love dipping a cheese toastie into some tomato soup and as Top Ender asked for soup for dinner one night (her love of tomato soup is almost as big as her love for Lasagne!) we should all be happy! I'm not sure why but I've been dreaming about lemon and garlic chicken and so I thought a quick slow cooker preparation with Chicken pieces, mushrooms, carrot pieces and possibly some potato chunks with lemon and garlic would make a lovely one pot meal. And if it doesn't well maybe I'll stop paying attention to the food I dream about! Mince and potatoes is a winter favourite here, so expect to see it a lot over the next few months. It's so simple to make and I'm going to make dumplings with the dish tonight which are slightly more complicated now that I can't use pre-grated suet due to the flour content. Still my dumplings are legendary so even though they are a little bit of a hassle they are well worth it. I didn't know what to do for dinner on Friday, I thought Veggie Pasta, I thought those lovely lamb burgers I talked about earlier in the week, maybe Sausage Casserole again or just to spite Daddy who has gone off Jacket Potatoes a special Jacket Potato... but in the end I decided on Home Made Meatballs (actually Daddy did but Sssh I don't want to give him a big head) with spaghetti. So that's this weeks meals, looking forward to some, hoping others work but mostly hoping that they all help me to stay full so that I don't snack so I can lose more weight! Before Big Boy was diagnosed as being a Diabetic we were going through bed linen like there was no tomorrow. You see, when Big Boy had a high blood sugar his body did everything it could to make sure that it got that extra sugar out of his body and this would mean numerous trips to the bathroom but when you are four years old and sleeping soundly sometimes you don't wake up when your bladder screams for the hundredth time that it needs to be emptied. Of course at the time we didn't know it was because of his Diabetes and so every morning we would assure Big Boy that this wasn't his fault and that he would grow out of wetting the bed. We told him that there were lots of other children who wet the bed and that it wasn't anything to be ashamed of, just that we'd have to try again the next night. I however was getting downhearted about it. My washing machine was going what seemed like all day and night trying to keep up with the extra loads of bed linen and the sheets and bedding were starting to fade with all the washing. The most recent water bill and electricity bill showed how much washing I was doing as it was way over what we had budgeted for based on previous years, and Daddy and I have joked that I need to do a lot of sponsored posts (like this one!) in order to pay the bill. To top it all off the bedding I had brought last Christmas already looked several years old and I thought that it would be a good idea to buy more childrens bedding so that we would always have some sheets spare, but before I had the chance to do so Big Boy was diagnosed and the night time wetting stopped. Top Ender was dry at night from the moment she decided she wasn't going to wear nappies any longer, (as was Big Boy really and if it hadn't been for the diabetes I never would have thought about this) but talking to other Mums in the playground I found out that bed wetting is a lot more common than some might think but that it isn't considered to be an issue until the child wetting the bed is over five years old and has at least two incidents a week. Even then some parents are really unsure of what they can do so I thought I'd write a post about what I had learnt with Big Boy's Diabetic nocturnal enuresis (it means wetting the bed at night!). So first things first, helping the child to not need the toilet in the night. Stop the child from drinking an hour before bedtime. Sips of water are okay, but keep it limited if you can and no caffeine either! Make sure there isn't a stress reason as to why your child is wetting the bed, a new school, a new baby. If there is then make sure to address the issue. Make sure the child empties their bladder before they go to bed. Get them to go twice just to make sure they empty their bladder. If the urine smells sweet or they need the toilet during the day a lot too then get to the Doctors to test for Diabetes. Don't be frightened of going to the Doctors to ask for help. There are medications that can be offered, bed time alarms and other forms of support but you won't know if it is going to help until you ask! There are some practical things you can do too. Have more than one Duvet and make sure the second one is easily accessible in the middle of the night, you don't want to wake up the whole house. Have more than one set of bed linen so you can make the bed as comfortable as possible. Have easy access to blankets, just in case you run out of duvets! Have several bed sheets and layer them with plastic sheets actually on the bed. Then in the middle of the night you can pull off what is wet without having to make the bed again. Make sure the child can get to the bathroom, maybe a night light is needed or a torch? Does the bedroom floor need tidying so it's easy to get across? I've also found out that as tempting as it is you shouldn't take an asleep child to the bathroom, they need to be awake to make sure that they know that they need the toilet and that they can release their bladder safely. It's all part of the brain training that is needed. This makes a lot of sense and I know if either Tops or BB wake up in the night for the toilet that they go to sleep really quickly afterwards so I think that your brain must be working slightly differently at night, but I'm no Doctor. Despite what people think rewards charts for dry nights aren't a good idea either. The bed wetting isn't something which the children can control, hence the problem of bed wetting in the first place! Reward charts should focus on something that the child can control, going to the toilet before bed, helping to clean up after they have had an accident or maybe even making sure they drink a set amount of water during the day so that they don't need a lot during the evening. So there you go, that's what I've learnt. Do you have any tips for helping stop night time bed wetting? And how can you stop bed linen fading from all the washing?! 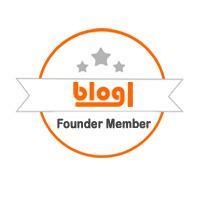 You can pretty much tell what generation a person is from by how they react to the title of this blog post. There was a time when Read-Along books were the bedtime reading of choice and I'm sure that up and down the country children were tucked into bed, the stereo started and parents breathed a sigh of relief that they weren't going to have to read the same book twenty times over in one night to their tired child. Things have moved on a bit since then, and whilst Read-Along books are still popular I see so many children listening to books on audio devices (they even do it at School round this way) that I'm pretty sure it is going to be the way of the future. Top Ender has a tablet which each night after she is tucked in she opens up to her reading app and reads what ever takes her fancy and we've downloaded for her. It's a nice way of helping her to relax, encouraging her to read and I always find that no matter how awake I am when I settle down in bed to read a book that after ten minutes or so my eyelids are drooping and I fall asleep in seconds. 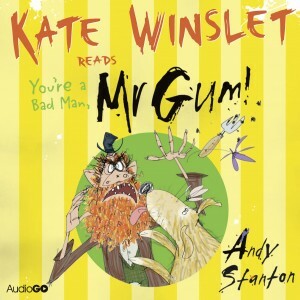 This week has been slightly different though as Top Ender hasn't been reading at bed time, instead she has been listening to Kate Winslet tell her a story about Mr Gum. Now before you all start wondering how on earth I know Kate Winslet, I should probably point out that it's actually an audio book, and whilst it would be lovely for Kate to pop in and read a bedtime story she is probably far too busy reading to her own children and being famous. Top Ender loved having the story read to her, especially last night when Daddy and I weren't at home (as we were at a performance of Blood Brothers) as normally this would mean she would have to read it herself instead of just laying back and relaxing whilst one of us read to her. I downloaded the book and uploaded it to Top Ender's Tablet all by myself, (which was actually a big thing for me) but it was really easy thanks to AudioGo's download process which gave me really simple step by step instructions. Top Ender listened to the last of the book last night and in her sleepy state asked for us to download some more audio books to her tablet, I love that she is embracing this new way to have a bedtime story and I'm hoping that this way we might be able to get her to read some of the classic stories that Daddy and I grew up with. Well, I can hope can't I?! We were given a free Audio Download of the book to review. Battered Fish is a comfort food for me. When I was growing up we lived a five minute walk away from a brilliant Fish and Chip Shop and we ate it fairly regularly. Even when Daddy and I were first married we ate Fish and Chips from the local chippie fairly often but after Daddy was diagnosed as Celiac we had to stop because the food wasn't gluten free. Eventually we did find a local Fish and Chip shop that sold Gluten Free food, but it's not really that local and takes fifteen minutes to drive back from (and they cook the food fresh because it's gluten free and of course it's a fifteen minute drive to the shop) so it's not something that's exactly cheap because of the travel, it's a fairly expensive place to eat at and it's not exactly Fast Food! So tonight I made Gluten Free Battered Fish and Chips for dinner. I had made Fish and Chips before using Haddock and polenta as a sort of bread coating, but it's not battered and that is what I was missing the most! So here is my recipe for Gluten Free Battered Fish and Chips. Turn the oven on to Gas Mark 4. Mix the Polenta, Egg, Milk, Seasoning, Herbs and Ketchup together to form a smooth batter. Dip the fish fillets into the two tablespoons of Polenta so that it is coated. The dip the fish fillets into the batter mixture so that it has an even covering. Place the battered fish fillets on to a baking tray. You can place the additional batter over the top of the fillets, but you don't have to! Cook in the oven for Twenty-Five to Thirty minutes and serve with Chips. Big Boy is normally my litmus test for if a dish is good or not. He looked at the fish, declared that he didn't like fish and was persuaded to eat some by Daddy... so he did and Big Boy then finished before everybody else! I'm not sure if it was the ketchup in the batter or if he is finally developing a taste for fish, but either way I'm going to keep making it this way. Heinz sent me some ketchup and asked me to come up with a recipe using the Heinz Ketchup as a Secret Ingredient, which I did with my Sausage Bean Casserole but I guess this is one too! Ages ago I was asked if I would like to try out some McCain Wedges as part of the Summer of Sharing and rustle up some meals to go along with them from some great recipies. All I had to do was choose from the brilliant list of meals and I would get the ingredients sent to me so I could get cooking without the hassle of shopping first. Knowing that the Wedges aren't gluten free I knew that the main part of the meal would have to be something that Daddy would eat and so I choose Greek Lamb & Feta Burgers and Jamaican Jerk Chicken. The Jamaican Jerk Chicken never happened as life got in the way, but the Greek Lamb and Feta Burgers were a big hit. The recipes are all on the McCain website, but in a nutshell all you have to do is mix all the ingredients together in a big bowl. Shape them into Burger Shapes and cook them. It really is that simple to make burgers and I realised that you can nearly fill them with anything that you want as I discovered when I put Parmesan Cheese and Chopped tomato in some home made burgers during the Summer. Whilst the burgers were cooking I put my Wedges into the oven to cook. The recipe suggested adding a little more flavouring by scattering Oregano over the top. I think that I gave them a little more Oregano than was probably strictly necessary, but I love Oregano and the Children didn't complain! I served the burgers with Cucumber and Red Onion and the extra Oregano wedges. Everyone loved both the burgers and the wedges and I have brought the wedges a couple of times (even though Daddy can't eat them) for the Children and I to share as a snack. The Wedges are lovely, as they are frozen and oven baked I don't have to think about cooking them, all I have to do is get them out of the freezer on to a baking tray and put into a hot oven. This is perfect for times when you know you should eat but really can't face cooking and can't afford yet another take away! I would never have thought of adding additional seasoning to the wedges, but since the first recipe suggesting it we've added grated Cheese, other herbs and spices (the extra paprika ones were nice) and I've realised that the children will eat anything if accompanied by chips, although I'm not sure if this is a good thing. The meal was one that we said we would make again, but I've only just remembered about it, a good three months after we first had it. I think it will be added to the menu again very soon, especially as with the weather turning cooler meals like this are my favourite kind. We were sent ingredients to make the meals and two packs of McCains Wedges.